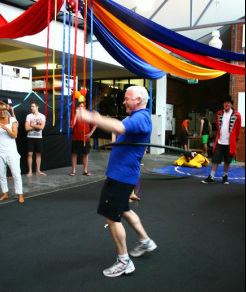 Puzzle Dust offers a range of corporate circus workshops in Brisbane, Byron Bay and on the Gold Coast to suit your needs. Our dynamic circus workshops include warm ups, group movement, team games and fun circus skills - and all equipment is provided. You can book a workshop on its own or try a package including workshop plus performance. Available in Byron Bay, Brisbane and the Gold Coast. Email us now to discuss a package that suits you. The boss gets his hoop on! Our circus packages are great for corporate team building, christmas parties, hens nights, festivals and community development... just to name a few. Workshops are not only fun and exciting, but also enhance participants' self esteem and encourage team building and group collaboration. Puzzle Dust instructors have $20 million Public Liability Insurance and WWCCs. We can come to you or book a studio for your event.